Meet Mal, Evie and the rest of the Villain Kids. Go on magical adventures and help your new friends. Dress up for parties, decorate your dorm and conquer Auradon Prep! 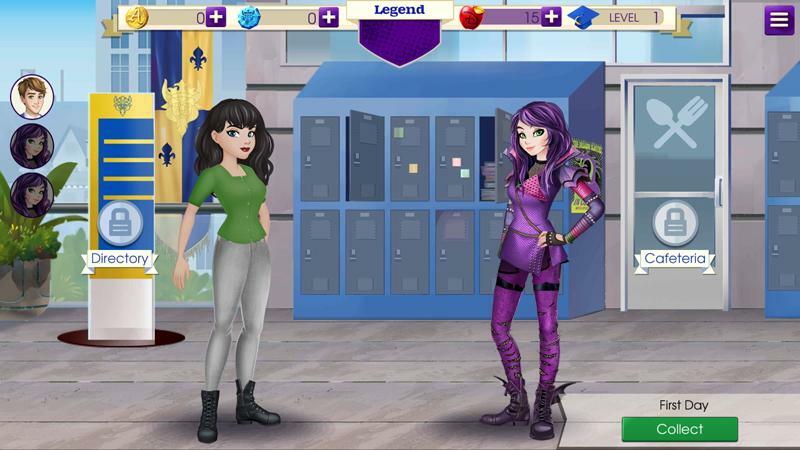 Disney Descendants is a simulation game inspired by Disney’s hit movie of the same name. Here, you are a new girl/guy in Auradon Prep, a prestigious school known for housing students of heroes and heroines. Get to know the Villain Kids and start incredible friendships as you help them complete important missions. Just like most simulation games, you can choose a gender for your avatar and customize most of your looks including facial shape, hair, eyes, outfit and shoes. The choices for clothing are pretty few, but you’ll have lots of time to unlock and buy more clothes later on in the game. Give your avatar a name and you’re ready for your first day in school! At the school entrance, you are welcomed by Ben, who is a down-to-earth prince and a helpful friend. He tells you about the prestige of Auradon Prep and gets you ready for the tasks you need to do. He tells you about the JMNI, which stands for Journal of Missions, Navigation and Intelligence. This is where you’ll find all completed quests. There are four parts to your JMNI and all these are found on the bottom right corner of the screen. They are Newsfeed, Closet, Contacts and Missions. Newsfeeds display any updates from your friends, Closet is where you can change your outfit and check out new ones, Contacts is where you see your friends and Missions list the quests you’ve accomplished as well as your Achievements. The first thing on your to-do list is to meet Mal, a Villain Kid and Malificent’s daughter. To go to her, you have to follow Ben’s instructions and swipe left or right to find the entrance to where you’re supposed to go. When you finally meet Mal, you’re a bit intimidated, but you find out she’s actually nice! Mal is asking you to help Evie get ready for a big school party. Again, you need to find your way to where Evie is using the signs on your way and by remembering what Mal said. If you get lost, you can always go back to the School Entrance and tap the Directory to view a list of all common areas in the school like Lockers and Hallway. From there, you can swipe left or right to find the appropriate entrance. Some entrances are locked if your current quest doesn’t require that you go there. By completing quests, you earn Spirit Points, which help you level up and fill up your Legend meter. You also earn some coins to spend on buying clothes and furniture for your dorm (later on in the game). The premium currency called Auradon Gems can be used to unlock missions that require some wait time. Gems can also be used to buy more Energy Apples, which you need lots of to complete missions. If you run out of Energy Apples and don’t want to pay for it using your Gems, you can wait until it refills. Each Energy Apple needs regenerates in 4 minutes. If you really want, you can always add Energy Apples, Gems or coins by buying them with real money. Be sure to keep completing Missions indicated on the left side of the screen. You can only do one Mission at a time, before you can move on to the next one. Always remember that you can use Ben’s Scooter parked at the School Entrance to go to other locations outside of Auradon Prep. This game’s graphics and dialogues are top-notch, and the kind you would expect from a movie and game leader like Disney. While there are no animations here, the images more than make up for it. The choice in outfits are creative and quite eclectic, giving players more options than the typical pink gown. 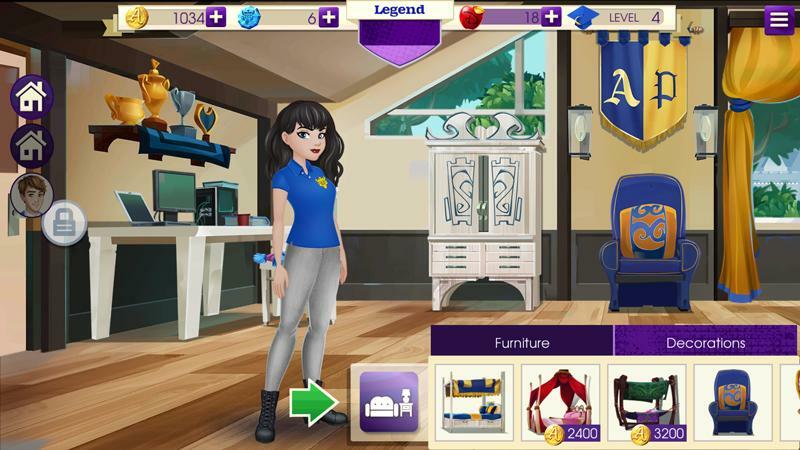 Disney Descendants is a hip simulation and mission-based game that speaks to the youth of today. Carrying the same witty dialogues from the movie, this digital version is a consistent extension of this world’s sassy and playful nature. This game is one of the few ones you can truly say that you’ll be chillin’ with the villains.